406km cycling event starting from Llandrindod. Controls at Tregaron, Llanidloes, Tywyn, Abertridwr, Newtown and Kington, plus 2 information controls. The ultimate memorial multi surface ride, styled along the lines of terrain encountered on routes such as The Tour Divide. Designed to test not only a rider's strength but also their capability to plan a ride. 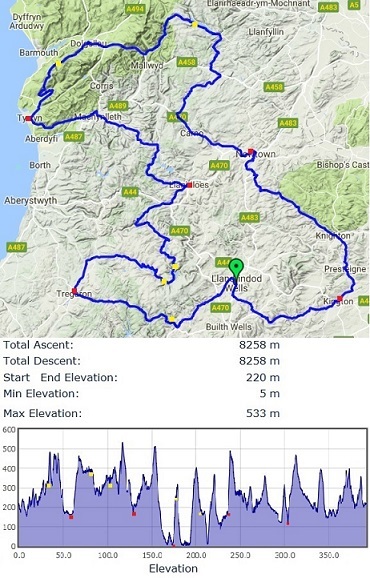 A route constructed to represent 'A Good Day's Cycling' in some of the ride's that Mike Hall rode in various parts of the world. Starting from Llandrindod, the ride takes the road to Beulah and onwards to Tregaron. As a 'warmer-up', the Devil's Staircase is the first challenge of the day.After a breather passing through the nature reserve, the ride heads back East along the Mountain track to The Elan Valley. Rising up The Elan Valley and down to the head of The Cwmystwyth Valley, the ride then takes the lane through Llangurig and onto Llanidloes. There will be a choice of nominated control cafes here. The ride then continues through the Hafron Forest, Staylittle, Machynlleth to the coastal town of Tywyn. Onwards to Dolgellau along NCR82, there will be a checkpoint along this lane. Rising out of Dolgellau on through Dinas Maldwydd to tackle Bwlch-y-Goes before dropping down to picturesque Lake Vyrnwy. Onwards over more grass dessert and then a welcome section on to Newtown. Climbing out of Newtown to (and through) the sleepy market towns of Knighton, Presteigne and Kington followed by a final stretch along deserted lanes for an arrivee in Llandrindod. The ultimate 'Day Ride'. 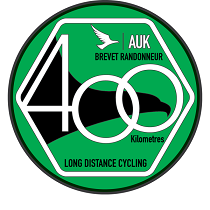 The route follows public rights of way throughout, some sections are on rough lanes/tracks, it is recommended that road bikes are fitted with 28mm tyres minimum are fitted. And to get the ultimate ride experience, there are places to bivvy overnight.